Jane’s love affair with Asia started on her arrival as a “wee lass” in Singapore (by boat!) in February 1963. A native Brit, life has ensured that she has boomeranged back to Asia — as a trailing teenager in 1970, followed by two stints as a trailing spouse from 1999, in the middle of which she sandwiched six years in New York City. She’s grasped opportunities to get involved, and sees her volunteer work with Friends of the Museums (FOM) as nothing less than life changing. She served as its president in 2003/4, has guided in three museums, coordinated the Explore Singapore! Team, led Study Tours to other parts of Asia, and ran film and book groups. An excellent organiser and administrator, she’s a passionate ambassador for her adopted home of Singapore. Particularly interested in heritage and history, she is also a keen supporter of the performing arts. A true citizen of the world, she speaks mother tongue English, excellent Spanish and good French, with a smattering of other languages, eg Portuguese and Italian, poor Malay, and almost non existent Chinese — leaving plenty of scope for self improvement! A second generation Singaporean, Alice is passionate when it comes to food. She loves to eat and to figure out what ingredients are found in each dish and how to prepare it. When traveling to different countries, she's keen on trying out local cuisines. Though fairly new at tour guiding in Singapore, she's got years of expeiences as a tour guide conducting driving holidays to Malaysia and Thailand with her late husband. When she's not guiding, Alice works with a social enterprise that provides job opportunities to persons with special needs. Gardening is another passion, and she spends time volunteering at the Fort Canning Spice Garden and at Gardens by the Bay. Alice speaks Mandarin and several local dialects, including Teochew, Hokkien, and Cantonese. Ni hao from Alfred ! Originally from Beijing, he has been in Singapore for over 12 years and is now a proud citizen of our fair island. A jovial, energetic, creative, energetic and well-spoken person, he has a warm personality & loves to meet people. As a licensed Mandarin tour guide, he enjoys leading professional, insightful tours for groups or individuals, and always tries to see things from our visitors’ perspective when deciding where to go and what to show them. During your visit, he would be delighted to answer your many questions, & believes that this personal interaction is what will make your time here memorable. Alfred loves guiding in his adopted home of Singapore and can't wait to show the world its many beautiful and interesting things - whether it’s the people, food, cultures, history, natural beauty, museums & universities, colonial buildings or modern skyscrapers. He holds a Master’s degree in Science and speaks fluent English as well as Mandarin. Betty Wee’s early retirement provided an opportunity to do a three-year stint as a volunteer in Israel. While there, she did pit-stop vacations in Europe where her curiosity for tour guiding was sparked. On her return to her native Singapore, she stumbled upon guiding at the museums and she is presently on a roller-coaster ride discovering hidden stories all over. Whether in the museums or out on the streets of Singapore, whether related to nature, culture, or heritage, she is discovering stories just waiting to be shared. Her enthusiasm and energy are boundless, and Betty was recognized in 2010 when she was an Active-Ager Awardee, due to her active volunteerism. An avid walker and jogger, she enjoys exploring both new and old places and takes joy in the natural beauty of her surroundings — in their many forms! Betty loves to wander the streets of the rich historical neighbourhoods of our island, and is at the same time fascinated by the gentrification taking place in so many places. Bruce Bird’s first visit to Singapore was in 1968 as a young Australian Naval officer on his first warship. He spent some 25 years in the Navy and an equal amount of time in private enterprise. Bruce’s other roles have included being the Assistant Defence Adviser to Singapore and Brunei, where he also dual-hatted as the Royal Australian Navy Liaison Officer in Singapore. In this role he was responsible for the resupply of visiting Australian warships. But his dream all those years was to become a Singapore Tour Guide and he is delighted to have recently achieved this goal! Nowadays his main objective is to work with people – whether they be Singaporeans, expats, or visitors – who are interested in learning about Singapore’s history, both general and military. Bruce also has a NATAS qualification, which allows him to take tour groups from Singapore to other countries all around the world. He speaks Australian and English! Not too far into Byron’s education he discovered that he’d much rather listen to a lecturer drone on about historical narratives, than macroeconomic theories or calculations of covalent bonds. Motivated by this, Byron pursued a Bachelor of Arts degree in History at the National University of Singapore. He then returned to military service with the Air Force as an Air Warfare Officer, and served for a total of 8 1/2 years. During his time as an instructor in the Air Force, he decided more could be done to renew other Singaporeans’ love for our island home. Byron grew determined to inspire the younger generation through interactive and engaging programmes showcasing the best of his beloved country. Armed with a newfound purpose, he embarked on the journey to become a Singapore Tourism Board licensed guide in 2017, and has designed various tours covering the urban and cultural development of Singapore. He is also a docent volunteer at the Singapore City Gallery by URA. When touring with Byron, you get the sense he’s genuinely interested in all visiting guests, and very keen about sharing his country in ways that are relatable no matter where you’re from. Be it sight-seeing or food-tasting, museums or the great outdoors, he believes a great guide can make all the difference to any new experience. Apart from History, Byron’s 2nd love is football. He makes the effort to watch his team play every week and considers his biennial football watching trips to the UK to be nothing less than pilgrimages! A trilingual cat, Catalina Tong has a warm persona and is passionate about guiding both indoors (yes, she guides in three different museums including the brand new Natural History Museum) and outdoors (Pulau Ubin has a special place in her heart). She is the consummate storyteller who goes the extra mile to find fascinating anecdotes. She is also an animal lover and bird whisperer at times. Catalina is espeically enthusisastic about heritage, culture, and food. To her, Singapore is truly a culinary paradise where eating is cherished and celebrated, whether tucking into nostalgic street food or savoring elegant fare in Michelin-starred restaurants. She has lived half her life in Singapore and half overseas. Catalina is a global citizen, but her heart lives in Singapore. She has an amazing depth of knowledge about our beautiful city and will enjoy being your ambassador when you are in town. She is fluent in English, French, Cantonese and speaks good Mandarin. Inspired by a childhood with her adventurous Dad - who took her & her siblings to scout the many “off the beaten track” parts of both Singapore & Malaysia - and before the demands of marriage, children & a career (in finance), Bee Lian dreamt of seeing the 7 Wonders of the World; & she managed to achieve much of that dream…. Armed with such a curious approach to life, it’s not surprising that she has become a passionate advocate for Singapore’s history & heritage! Not only has she volunteered at the Sentosa Maritime Museum (including involved delving into the old maritime silk route and as far back as Marco Polo & Admiral Zheng He), Gardens by the Bay, the URA City Gallery, the National Library, the Preservation of Monuments Board and various other heritage museums, she’s also researched the Telok Ayer area in depth and loves walking around Singapore and making new discoveries about our small but intriguing country every day. She also travels overseas, both near and far, to learn how Singapore was, and is, connected to the region and beyond. Bee Lian is licensed to guide in English and also speaks Mandarin and Malay as well as several Chinese dialects - Hokkien, Teochew and Cantonese. Chong Eun’s life in Singapore began with her family’s relocation here at the end of 2010. Her new life at first seemed challenging as it was the first time she had lived outside of Korea. But thanks to guiding as a volunteer docent at the National Museum of Singapore and the Malay Heritage Centre, she became fascinated by the heritage and culture of Singapore – something quite new to Korean visitors. So she decided to be a tourist guide and help them enjoy the diversity of Singapore's culture and history. Her name has helped her in Singapore as ‘Chong’ is a common name among Chinese Singaporeans, and ‘Baik’ means ‘good’ in Malay. She only needs to add a Tamil word to be a perfect fit for Singapore’s multi-racial society! Chong Eun is indeed a ‘Baik’ and friendly guide who loves to share her passion for her new home. She is a licensed Singapore Tourist Guide, fluent in Korean and English and a keen student of Singlish! Darren is bringing down the average age of our guiding team & injecting youthful energy into our tours! He's a final-year Geography undergraduate at the National University of Singapore, and is particularly interested in the modern development, urban planning and socio-political aspects of this fascinating city-state in which he was born and bred. His foray into the tour guiding scene started a few years ago when he undertook stints at the Singapore Discovery Centre, Science Centre and Sentosa. He loved the regaling of stories, knowledge-sharing and excitement that guiding entailed, and decided to feed his passion by jumping straight in and getting his STB guiding licence. In his free time (when he not busy studying, of course), he conducts walks of the Singapore River and Chinatown, and loves dreaming up crazy ideas for new tours to bring people around! Darren speaks English, Chinese and a smidgen of Malay, and is attempting Spanish next. Ed was born and bred in Singapore and has lived here all his life, except for four years living in West Berlin in Germany before the fall of the Wall. He was in sales a marketing for many years supplying medical, technical and scientific instruments to hospitals, universities and high-tech companies in Singapore. He left marketing in 1998 for a less stressful profession, and to follow up on an interest and curiosity he has always had about the natural world. Since then, he has completed a great deal of self-study and attended numerous talks, lectures and presentations on flora and fauna and still does so today. He has also visited many important mangroves and rainforests in Southeaset Asia to learn about their importance to our fragile environment. Ed earned his STB license in January 2000 and is a general as well as a specialist nature guide registered with STB, as well as a volunteer nature guide with the National Parks Board. Ed speaks English, German, dialects, and some Malay and Thai. Elaine blames a childhood diet of fantasy & adventure tales for her belief that there's always something fascinating waiting to be uncovered, and that we only need to look deeper to discover something amazing! Her enthusiasm for sharing new insights led her into the teaching profession, and some years later to exit from it in order to make the world her classroom, rather than confining lessons within 4 walls. She does this by bringing students on overseas study tours & attachment programmes, as well as through sharing aspects of Singapore's history & culture with fellow explorers on her local tours. Elaine taps upon her love for the arts to bring interesting perspectives to local stories & issues, and believes that the ‘Singapore Story’ is encapsulated within our local food culture. She invites you to join her on a journey of discovery (or re-discovery) in English, peppered with smatterings of Mandarin, the Teochew dialect & German. A Munich-born, London-trained historian of French colonial Southeast Asia, Frederik arrived in Singapore in 2004 to be with his Singaporean girlfriend (they eventually got married in the Old Parliament!). 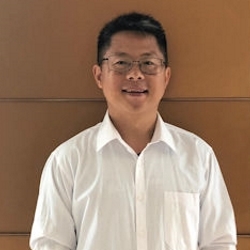 After brief stints with the Asia-Europe Foundation and the Asia News Network, and living in three different generations of HDB flats in his first year, he joined the Singapore Management University and became a founding member of its new School of Social Sciences. Based in the Bras Basah area of the old Civic District for the next half dozen or so years, Frederik's teaching and research eventually led him to discover the joys of extending his office and classroom to the nearby areas when the fascinatingly multilayered urban and natural habitats, some visible, some invisible, began talking to him. After his contract came to an end, Frederik decided to abandon the security of his coconut shell by embracing a new life as a tour guide, in which capacity he makes Singapore his oyster by weaving together stories and histories, plants and birds, geography and chronology, foods and fruits, in ever new ways, to ever changing audiences (he loves playing host), and in dynamic settings. Frederik speaks fluent German, French and English, plus (of course) Singlish. Gek belongs to Singapore’s baby-boomer era. She was born in a house in the notorious Jalan Besar area and spent her growing up years in Little India where she learnt how to count one to 10 in Tamil from her Indian friends next door with whom she played and fought with in the back alley. She was schooled in a Christian mission school and spent most of her adult working life in a government ministry. In 2012, she decided to retire herself early for a more leisurely life. Five years on, Gek finds her plate full with her docent duties in different museums and galleries, as well as the various tour guiding assignments she undertakes on a freelance basis. She is passionate about Singapore and always ready to share everything she knows about this little red dot’s past, present and future. So when not guiding, she is likely burrowed deep in her readings and research; out looking for interesting spots to explore; or learning from others about heritage, history, culture, and all-things-Singapore. And she is loving every minute of it. Her language skills include English, Mandarin, Teochew, Hokkien, Cantonese … and of course, she has not forgotten her one to 10 in Tamil. Jimmy has been a tourist guide for the past 40 years, i.e. he was virtually born to it! He enjoys going off the beaten track to explore Singapore's nooks and crannies and is both particularly fascinated by and knowledgeable about the country's World War II history. Being Singaporean, he is of course an obsessive foodie and is always looking for great new places to "makan." In his free time, Jimmy loves to explore other countries around Southeast Asia and discovering the rich culture and heritage of the region. In addition to English, he speaks Malay. Joe is a born and bred Singaporean, and like many fellow countrymen of his generation, has seen a huge amount of change to his homeland as it has progressed from Third World to First. Tangible changes include singing 3 national anthems: "God save the King/Queen" (under the British), "Negaru Ku" (when Singapore was part of Malaysia) and since 1965, "Majulah Singapura"! In a varied career spanning 50 years he has worked in the Singapore Civil Service, had a 25 year career in the Singapore Armed Forces, including 3 tours of duty as a Commanding Officer in the Air Force, and a stint as a stockbroker. His latest passion is Tour Guiding. Joe is most at home with nature, having grown up in a village on the edge of a mangrove forest, and indulging in such activities as catching crabs and fish with his bare hands and climbing trees like Tarzan (Jane & he get on well!). He experienced first hand the traumatic days immediately after the Japanese occupation when food was scarce. He was brought up on tales of horror and suffering by village folks who survived the Japanese invasion and the fall of Singapore. This, coupled with his experience in the SAF, enables him to give a consumate and very personal account of events leading to the leading to the Fall of Singapore, and the over 3 years of life under the Japanese occupation. In addition to exploring the impact of WW2, Joe can show you our “heartlands” including the best places to sample our many & varied cuisines. Joe guides in English but also speaks the Teochew dialect as well as Malay. Trading in her corporate heels for comfy walking shoes, Lianne is on a mission to showcase Singapore’s colourful facets, multi-cultural heritage, diverse lifestyles and neighbourhoods to overseas guests. Lianne spent over 20 years as a marketing and communications professional in the hospitality and technology industries where marketing budgets, working with journalists, and micro-managing executive-level customer events were part of her daily routine. Her love of travel has taken her to many cities in Asia Pacific & Europe, as well as a work stint in the US. She has also researched and planned educational workshops, designed itineraries & led Singapore students on their learning journeys to countries like France, Germany, UK & US. Lianne is always keen to do her little bit for charity and regularly travels to Cambodia to help at Touch-a-Life, a humanitarian organisation that serves free nutritious meals to less privileged children. She volunteers at the National Library Board’s KidsRead programme and is a volunteer Docent at our National Gallery. Lianne holds a Bachelor of Arts (B.A) degree with double majors in Sociology and European Studies from the National University of Singapore, and has recently completed a Master of Education programme from Monash University, Australia. She guides in English, is conversant in Mandarin and dreams in…?! Min is orginally from China and became a travel enthusiast as far back as the 1990s. She explored Tibet, Xinjiang, Qinghai provinces etc, which were still thought of as another planet for most Chinese at that time. Her odyseey extended when she went to Germany in 1999, living in Berlin for eight years. During that time she really came to appreciate meeting people with very different cultural backgrounds. Back in Shanghai, Min worked as a programme designer in a broadcasting company promoting lifestyles with themes like music and travel. She feels at home in both the East and West. Moving to Singapore in 2011 with her family, she immediately fell in love with the country, a place with a fusion of different cultures. Interested in history, art and people's stories, she became a volunteer guide at the National Museum. Outside of the museum, she was surprised to hear many Chinese tourists claiming that Singapore is a country with no history, and feels that it's time to help people connect with the "real Singapore!" Min is a licensed Singapore Tourist Board guide and fluent in Mandarin, Shanghai dialect, German and English. Growing up in Czechoslovakia, Pavla set out to discover the world as soon as the Berlin wall collapsed, and at 22 she came to Singapore to study Mandarin. Her years living, studying and working in different countries plus her two “third culture” children born to her and her Swiss-French husband, have given her a broad understanding and appreciation for diversity. After learning the art of tour guiding as a volunteer guide in the National Museum of Singapore and Malay Heritage Centre, Pavla reinvented herself as a professional tour guide to share her passion for her island home. With an interest in history, culture, architecture and languages, she loves connecting the cultural dots. Pavla’s caring and positive attitude ensures she easily relates to people from different walks of life. Pavla speaks English, French, Mandarin and Czech. Licensed Singapore Tourist Guide, and Certified Docent at National Museum of Singapore and Malay Heritage Centre. Ayant grandie en Tchécoslovaquie, Pavla a entrepris de découvrir le monde dès l'effondrement du mur de Berlin. À 22 ans, elle est venue à Singapour pour étudier le mandarin. Ses années d'études et de travail dans différents pays, ainsi que ses deux enfants avec son mari franco-suisse, lui ont permis de mieux comprendre et d'apprécier la diversité. Après avoir appris l'art de guider au Musée National de Singapour et au Malay Heritage Centre, Pavla s'est réinventée en tant que guide touristique professionnelle pour partager sa passion pour son île d'adoption. Intéressée par l'histoire, la culture, l'architecture et les langues, elle aime connecter les points culturels. L’attitude positive de Pavla lui permet de nouer facilement des liens avec des personnes de différents horizons. Pavla parle anglais, français, mandarin et tchèque. Pavla est guide touristique agréée de Singapour et guide bénévole certifiée du Musée National de Singapour et du Malay Heritage Centre. Wan Ling is a nature guide who enjoys sharing her knowledge of plants and animals with anyone who is willing to listen to her. As an IT engineer with a Japanese MNC, she used to spend her weekends outdoors with her birding friends. The advent of digital photography allowed her to combine this with birding, increasing the opportunities for her to observe nature. She is an active volunteer guide with the National Parks Board and guides at various parks and nature reserves all over Singapore. Her favourite haunt is Sungei Buloh Wetland Reserve. When she is not guiding, you may find her on one of the platforms at Sungei Buloh watching the world (birds) go by. Wan Ling speaks English, Mandarin and Cantonese, and is conversant in Japanese. Born and brought up in the vibrant city state of Singapore, Rachel is a ballet nut and indulges in the smell of old books. She enjoys losing herself in a good read, especially topics on Singapore’s heritage and the arts, both of which she is passionate about. For over a decade, Rachel worked at the National Museum and National Gallery Singapore in the areas of public education and audience development, where she developed interpretive content for diverse audiences. Combining her industry experience in the arts and communications, Rachel is a teacher as well as a licenced guide, and takes delight in regaling visitors with interesting narratives of Singapore, particularly on its heritage and the arts. Upbeat and energetic, she enjoys playing host to visitors from far and wide as they deepen their appreciation for the place she fondly calls home. Rachel speaks English, Mandarin and a smattering of Hainanese. Ask any of her friends and they will tell you that there is no one who loves Singapore more than Yun-Shan does! Inspired by a teacher from school who made learning history fun through storytelling, Yun-Shan developed her passion for guiding when she first started as a volunteer bringing people around museums and Singapore’s historical buildings. A true blue Singaporean, she has worked in the community sector for the past decade. A profession that has given her the opportunity to interact with people from all walks of life. Her job has brought her all around the island and greatly enriched her appreciation of the different layers of Singapore society. Yun-Shan enjoys Singapore’s historical districts most. When she is not at work or guiding, she loves to dig into the national archives and records to unearth interesting stories of Singapore’s past. Stories which you are unlikely to find in a tourist guidebook, but would definitely bring a place to life and leave you with a greater understanding of Singapore. Yun-Shan believes that the best way to experience the city is to see it through the eyes of a local and hear about the stories and anecdotes associated with its past, present and future. She guides in English and secretly wishes that she could be better at speaking Mandarin and Cantonese. Shanti Bhattacharya is a Singapore Tourist Board Licensed Guide in English, French, and Russian. Shanti was born and grew up in Singapore in the 70s, worked in Paris for H.E. Mr David Marshall in the 90s, and following that, lived 20 years in Moscow during the heady days of glasnost and perestroika! During her time in Paris and Moscow, she organised and conducted various cultural and walking tours, raised funds for orphanages and hospitals by organising bazaars involving up to 130 foreign embassies, and held ex-co positions in various Women's Groups like International Women's Club and Asia-Pacific Women's Group. In 1985, Shanti set up and managed the Peranakan Museum in Emerald Hill Road where she worked for several years. During this time, she also performed in Peranakan-themed stage shows and theatre. She is back in Singapore seeing her son through National Service and makes regular trips to Moscow where her husband still lives and works. In addition to English, French, and Russian, she is also fluent in Bengali and Malay. Born and bred locally to a family that owns a (rather famous!) F&B joint, Simon's love for food and all things Singaporean is evident. A great fan of everything connected to his home country’s culture and history since his youth, he studied tourism during his time at college, but decided to go out into the corporate world to explore other options. He’s now back as a full-time guide to do what he loves. He’s a frequent traveller who runs his own travel blog showing the wonders of the world through the eyes of an adventurous and flexible traveler. He has a particular interest in all things related to food, art, architecture, culture and music....oh, and great coffee! When he has time, he does other forms of guiding, from bicycle tours to walking tours and food tours. Speaks English, Mandarin and Malay, attempting Spanish next! Before unexpectedly moving with her family to Singapore in 2013, Yeonsil worked as a government officer for 10 years in Korea. As a history buff, she became a volunteer guide in the National Museum of Singapore and soon discovered a passion for guiding. She enjoys meeting and connecting with people from many different countries and sharing her knowledge about her new home, the lovely country of Singapore. However she discovered that many Korean visitors weren’t able to appreciate the rich history of Singapore due to the language barrier. So she gathered a group of Korean colleagues to provide regular Korean tours in the Museum and they have proved a big success. She now wants to expand her love of guiding by sharing the best of Singapore outside of the Museum with Korean visitors and residents. These will be the first Korean walking tours specialising in Singapore’s heritage and culture. Yeonsil is a licensed Singapore Tourist Guide and is fluent in Korean and English, and is learning Singlish!